How to arrange multiple images in one page and convert it to PDF with A-PDF Image to PDF? I am an amateur photographer. So far, I have accumulated a lot of photos/images. I would like to convert them into a PDF file with a specific order, so that I hope that I can arrange the order of images before converting to PDF. How can I arrange multiple images in one page and convert it to PDF with A-PDF Image to PDF? A-PDF Image to PDF is desktop conversion tool for Windows. With using this software, you can easily scan paper to image and convert image to PDF in a few click. 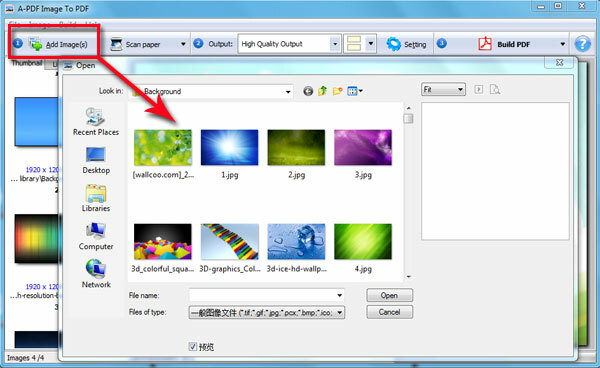 It almost support all images format to importing, including jpg, gif, png, bmp, pcx, bmp, ico, tif, jpeg, etc. You can also control the order of imported images before converting to PDF document. In below article, you can learn how to arrange and convert. 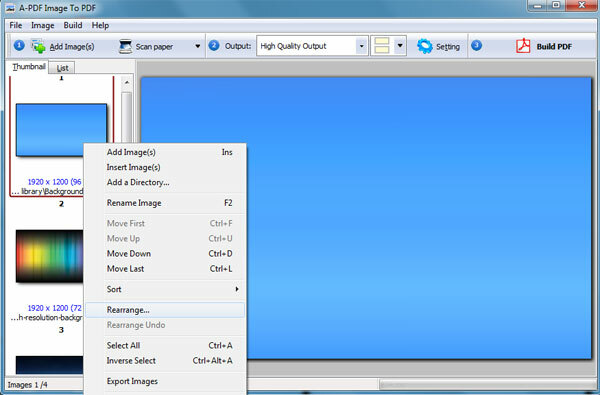 Step3: After managing, choose output quality and then build PDF.